While February has been lacking a lot of films to watch, March has a surprisingly huge amount to choose from with even a few of those releasing in the same week and I had to leave out some films which I feel won’t perform that well such as The Hurricane Heist. These are the films that you need to look out for this month. Based on the book of the same name, Red Sparrow concentrates on the life of a former ballerina who is now a Russian spy and must work alongside a CIA agent to survive. Jennifer Lawrence plays the main protagonist alongside the likes of Joel Edgerton and Jeremy Irons. It initially received criticism for being too similar to Black Widow of the Marvel Universe but has then managed to convince us it’s an original script and idea. Despite of that, this decent looking spy film looks really suited for those who enjoy a sense of intrigue with a bit heavy of violence and action scenes which is clearly hinted in the trailer. When Disney decided to make a live adaptation of A Wrinkle in Time, many knew it was not an easy task. There was the search for the main character and the question of how and which perspective will the film take. This feels like Disney’s version of The Dark Tower. However it looks like Disney might be able to pull it off after all. The film will focus on Meg Murry played by newcomer Storm Reid who must search for her father after his disappearance a while back which occured the same time a form of time travel has been invented. Oprah Winfrey, Reese Witherspoon and Chris Spine star in supporting roles and if we give this film a chance to shine, it might actually surprise us all how good it really is. A reboot of the previous Tomb Raider films, the new Tomb Raider film will be based on the 2013 game of the same name and will borrow elements from it’s sequel the Rise of the Tomb Raider. Movies based video games have never been a huge success and the best ones are just pretty mediocre. The last film to do so which was Assassin Creed was a major let down. Fortunately for us, it looks like the curse will finally be broken. Oscar winner Alicia Vikander replaces Angelina Jolie for the titular character and the film will take her to an unknown island after finding out that was the last known place his father was in before he disappeared. The trailer contains some pretty slick action scenes and it’s safe to assume that the movie will too making it one film we shouldn’t miss. Gringo is a dark comedy that centers on businessman Harold Soyinka who is hilariously played by David Oyelowo as he has to try to survive after he has been kidnapped by the Mexican cartel while on a business trip to sell a new form of drug. From the trailer, we can tell its going to be one of those films where we can just lay back and have a laugh alongside the action set pieces. With people like Charlize Theron and Joel Edgerton in supporting roles as Harold’s untrustworthy superiors, this looks like a perfect popcorn flick. Last year was a terrific year for horror movies. Films like IT became the highest grossing horror film of all time and Get Out performed surprisingly well with both critics and audience even managing to earn itself 4 Oscar nods including best picture. It looks like The Strangers: Prey at Night will be the first decent horror film of 2018. A sequel to the 2008 film The Strangers, it follows a group of people on a road trip who are suddenly targeted by 3 masked vigilantes who makes their lives complete hell. They really nailed the trailer by using Tiffany’s “I think we’re alone now” as its soundtrack, creating a chilling and petrifying feel in the atmosphere. The original film gained over 9 times its production budget and it’s safe to assume that the sequel will also be a box office success. The sequel to Guillermo del Toro’s Pacific Rim, Uprising had a lot of trouble back in production and even reached a point where it was declared the film itself would be cancelled. Del Toro wasn’t able to return to direct and the main character Charlie Hunnam wasn’t able to reprise his role due to scheduling conflicts. Somehow the studios managed to bring it back to life and we have John Boyega of the new Star Wars trilogy and Scott Eastwood, son of the legendary Clint Eastwood as our two main leads. It’ll take place 10 years after the previous film and of course the Jaegers return looking much more ferocious than before. 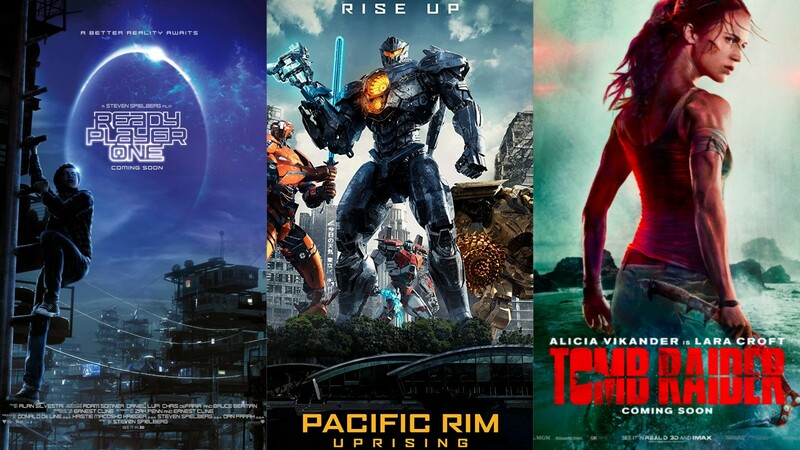 It’s pretty clear that we’ll be in for a lot of robots fighting monsters and while it has a chance of performing below expectations in the domestic box office, this kind of film will attract a whole lot more people internationally. Award winning director Steven Spielberg returns to direct and bring to life one of New York Times bestseller, Ready Player One. It takes place in a dystopian future at the year 2045 and focuses on a teenager who must search for an easter egg in a virtual reality(OASIS) world which will grant him inheritance to the OASIS itself. We all know that Steven Speilberg is one of the greatest directors that have ever lived and even though the film don’t contain any A-list stars, we can tell from the trailer that this is going to be one awesome festivity for our eyes as its filled with outstanding visual effects and loads of easter eggs. And that’s the main selling point of the film, amazing us in loads of different ways. Well that’s it for the month. It looks like we’ll need to sacrifice a lot of time to catch all these amazing looking films so save up your money and have a great month!